South Mountain’s Last Inholding Protected! In September of 2016, Wildlands Conservancy permanently protected the last 1.5-acre inholding of our Emmaus-based South Mountain Preserve. Situated in Salisbury Township, Lehigh County, within the existing 350-acre nature preserve, the 1.5-acre tract is significant for the stewardship continuity it brings to South Mountain Preserve, a priority landscape for the Lehigh Valley and Lehigh River watershed. Generous donations from Jane and Michael Benning, Karen and Rick Poshefko, the South Mountain Preservation Association and the Rodale Family Foundation enabled Wildlands to acquire the property from the Smoyer family. 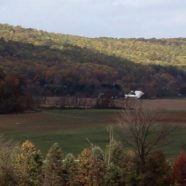 The tract also notably helps buffer Wildlands’ Wilderness Trail, which expanded the preserve’s trail network last year by establishing a new connection between the City of Allentown’s South Mountain Park and South Mountain Preserve, which together make up the 750-acre Robert Rodale Reserve.